The Gunpowder River is flowing at 89 CFs and is 52.5 degrees F. Wild fish have moved into the riffles and are taking small caddis in the #16-18 range, BWO’s sized #18-22 and small weighted streamers. After lots of low water through August and September many lucky anglers arrived on the River this weekend to ideal flows for wading. With football in swing there was a little more room on the river to stretch a long line. Please note: The shop will be open from 2:45 till 5 PM on Monday and closed this Tuesday and Wednesday. 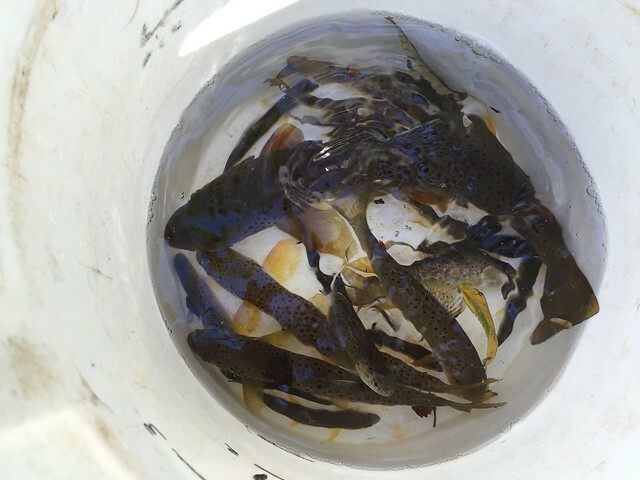 This entry was posted in fishing report on September 27, 2015 by Theaux Le Gardeur. 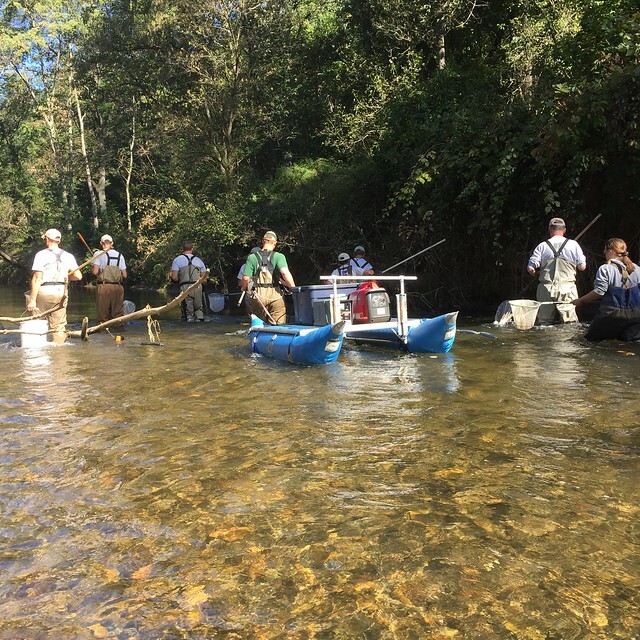 Thanks to the volunteers, the MDDNR fisheries staff from the Central and Western regions of Maryland and MBSS staff that drove all the way from Annapolis to make sure that the fish populations in the Gunpowder River are sustainable. This entry was posted in news on September 25, 2015 by Theaux Le Gardeur. 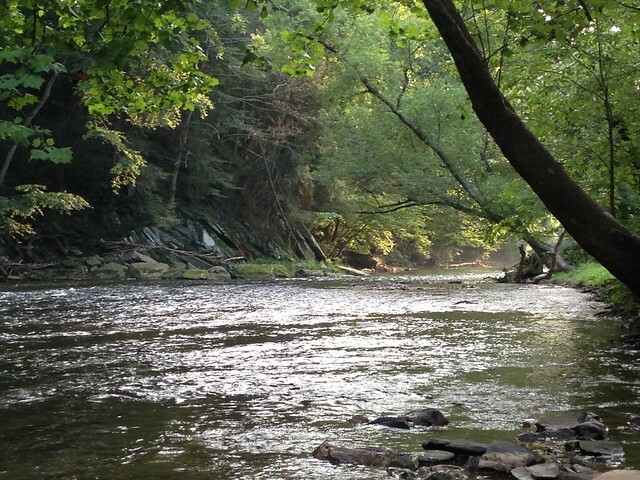 We would like to apologize for the short notice, but we will be conducting our fall electrofishing survey on the Gunpowder Falls tailwater for Sept. 22 and 23. Meeting time will be at 9:30 each morning. Sept. 22- Dam/Falls Station–meet at the upper Falls Rd. parking lot. Sept. 23- Bluemount Station–meet at the Bluemount Rd. entrance to the NCR TCB trail. We are sampling our Masemore station on Monday 9/21, but we have all the needed help for that day, so I am only asking for help/observers for the 22nd and 23rd. This entry was posted in news on September 19, 2015 by Theaux Le Gardeur. The Gunpowder is flowing at 162 CFs and is 54 degrees. Streamers fished on a 5 foot sinking leader and a two to three feet of 4x are a great way to cover the boulder pools. Heavy riffles at Masemore through Bunkerhill are best fished with #16-18 bead head nymphs. With football in full swing and schools back in session the River is a lot quieter. Summer is fleeting, the River is dropping after 2 inches of rain locally and the Tricos should be coming off just around the next corner. Mike Bachkosky’s reverse-hackled Trico patterns are now available in a size #24-20. Please note: In addition to our regular Wednesday off, the shop will also be closed this Tuesday, September 15. This entry was posted in fishing report on September 14, 2015 by Theaux Le Gardeur. Fly Fishing the Gunpowder this Labor Day weekend? Start early to get the most out of your day afield. With the water at 31 CFs use the trails to get to the shaded bend pools and riffles. Water temps are swinging by mid-afternoon from 48 degrees to 55 degrees. Try ants in the flat water, caddis in the riffles. Beetles along the banks are a good bet. Don’t leave home without 10 to 12 ft leaders ending in the 6x to 7x range. This entry was posted in news on September 4, 2015 by Theaux Le Gardeur.